Social networking is going corporate. The popular technology used by millions of people to share ideas and photos on MySpace, Facebook, LinkedIn and others is catching on at companies to improve productivity and communication among workers. Private, internal social networks make sense as companies grapple with a slumping economy that has made travel cost-prohibitive even as workforces are spread out as never before. Indiscretion - Inadvertent disclosure of confidential information is also a risk. You wouldn't publish your organization chart and phone directory on the internet; but a head-hunter or identity thief can use information on social networking sites to reconstruct this kind of information. Broken privacy and identity theft - Some sites also allow third parties to run applications that have access to user profiles. This is a potential privacy risk. People publish a wealth of personal information in their profiles. This makes social networking sites a happy hunting ground for identity thieves and conmen. Cyber-slacking - Social networking sites can be addictive and time-consuming. Cyber-slacking is a genuine concern. Reputation risk - There is also a risk to your company's reputation. 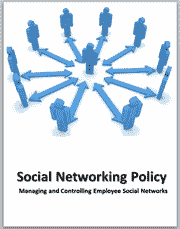 Social networking is more public and less formal than company email. It is also easier to use than blog software. It's easy to imagine employees posting pictures or text that would embarrass the company. Viruses and spyware - Social Networking sites have links and cookies that can do harm. In addition they often display advertisements.